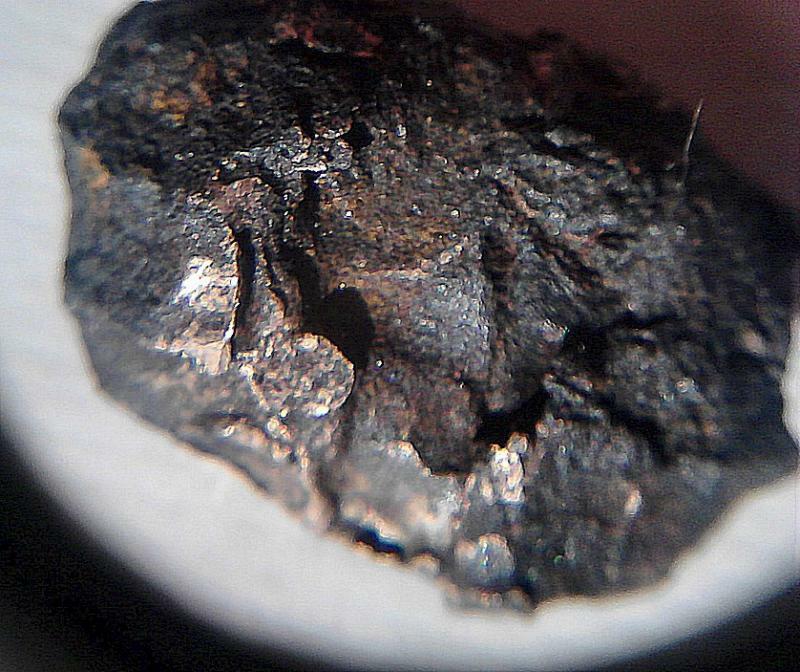 Did a google search for "copper in meteorites"
Which led me to a link about green fireballs and copper residue found after them, They are seen in SW, I am in SW.
What I have appears to be solid copper in spots, looks like the whole things been through massive heating forming a black crust, and it just looks like its from space/meteorite like to my untrained eye in person. I know pictures don't show everything clearly. When copper burns it does make an eerie green hue....so maybe we have a solution to green fireballs, and an answer here to my find? what if this is a copper/iron meteorite? There is def some kind of crust that appears to be a "fusion crust" covering it, with bright metal below that. Could this be a copper green fireball meteorite? Im thinking maybe yes. Mike Im a nobody that knows nothing, but something tells me this is not slag,..
No, the color of a meteor has very little to do with its chemical composition, as the light you are seeing (the meteor) is a result of the Earth's atmosphere being ionized. Meteoroids do not get hot enough to "burn" or "melt" during entry, merely the very outer crust heats enough to vaporize. Another older eyewitness account VERY interesting READ! this one almost hit the guy lol it whizzed past his head into the dirt and it was still so hot it burned his fingers? Please stop, these are not scientific accounts and are easily debunked. You most likely do not have a meteorite, most people who do not know meteorites often think they have one when they find something they can't easily explain. It is a Cadweld slug. I recognize it from the coppery finish. It is not a meteorite. I bet a dollar it is a bad Cadweld shot from a city electrician. I bet there is a gas line or an electrical conduit around that they were working on. They use it all over in industrial electrical applications. It does not look like slag because it is fluxed. That beady skin that you washed off was the flux. Cadweld is a powdered metal mixed with gunpowder for connecting ground rods and cables. It is about the only copper/iron mixture I know of. That is my best guess given the info so far. Check out the porosity of the surface. That is bubbling from oxygen while it was hot. That only happens on earth. Just read an article about green fireballs/meteors people have seen for years searching for "copper in meteorites"
Interesting article about the Eaton Copper meteorite with the only two pics (black and white) I could find will keep looking Mike, maybe you could dig up some better ones or someone can find some pictures of it? Some experts I read say the green glow sometimes is caused by the copper in the meteorite burning up? 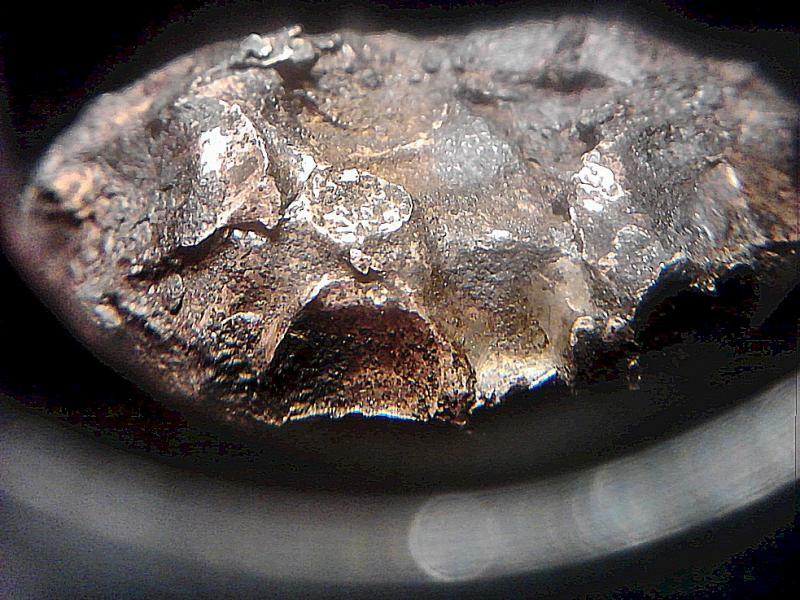 If there is copper in meteorites, Maybe I have one? it really looks like copper and this looks like fusion/heat crust on a meteorite to my untrained eye, and the way its mottled is very strange. Do you have a picture of one? I looked them up its hard to tell to compare it. Also they a mixture of copper/lead? When Compared to a new penny the copper color of this thing is several shades lighter than a penny, almost but not quite to brightness of gold in color. Hey everyone listen, im a TOTAL Gnoob I know nothing about this subject but I try to stay open minded and not discount ANYTHING until im sure what Im dealing with and right now Im not convinced yet that its NOT a solid iron/copper meteor to be honest..
On other hand im no dummy, you people are a lot smarter about this than I am, and im ALSO NOT sure/convinced it isn't a piece of amazingly meteor looking hunk of copper/iron/lead that was created by the chipper somehow to look extraterrestrial in nature, and or some other modern copper hunk of junk alloy that somehow got burned heated greatly, so much so that it APPEARS to have been burned at some time in space fusing a crust on it. and while everyone might be right about it and Im wrong, you also might be wrong and Im right, so I try to keep this in consideration till its known Exactly what it is. And saying that, I also do so much appreciate everyone's input and don't take my dedication to continuing to seek what this is as a sign im not listening to feedback here. I am and I respect all of your opinions greatly, but there is something unusual about this find and the appearance and weight. In person under the loop its very strange looking and it is copper in appearance but lighter this could be due to an alloy of some kind. 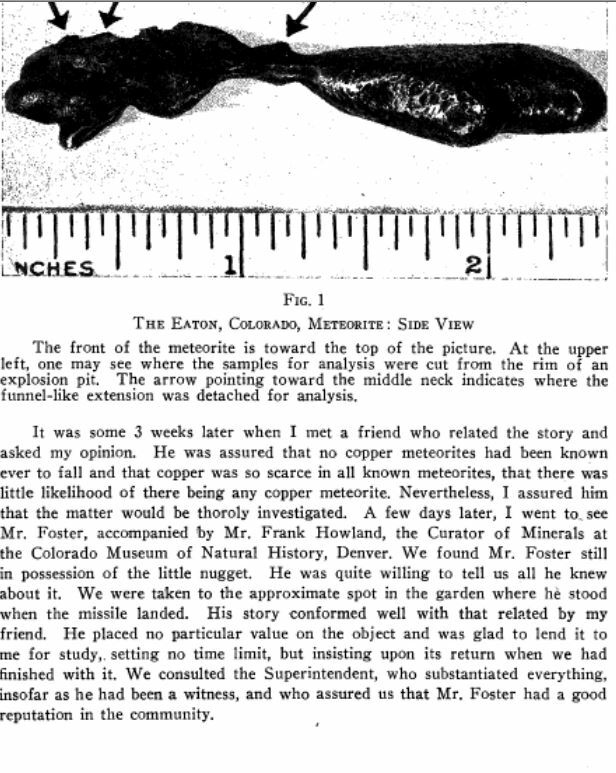 Below is the only pics I could find the Eaton Colo "copper" meteorite that H. Nininger purchased in 40s..from Foster the eyewitness. I wish there were some colored shots I cant find any? Can any of you help me out? He said he tried for years to duplicate the look of this copper, but couldn't? I would like to see what it looks like up close. Also It appears this particular Eaton COLO. meteor may be located Maria Mitchell observatory in MA according to credits. in the abstract, does anyone know where it is ? I have no idea otherwise, I will contact them if no one can help here. I would love to see a color hi res photo of this meteor to compare to mine in appearance. Can anyone help me out with pics of the Eaton Meteorite? thank you again everyone its very fun and interesting researching all of this! says Part of the Nininger Collection was sold to the British Museum in 1958, and the remainder of the collection was sold to the Arizona State University Center for Meteorite Studies in 1960 which displays a selection of these meteorites in their public museum. Ok now I know where to look, I just hope one of them still has it - the Eaton Meteorite, Im REALLY really Surprised there are no pics I could find easily of it the net? Seems like a pretty famous meteorite to have no pictures of it just some blurry bw's? Also it is one with an eyewitness that Harvey actually Met interviewed was show the spot personally, and when it was found, and discovered to be copper, it shook up the scientific world back then, as no copper meteorite was believed to have been found or even existed, it is also one he studied for years and years trying to recreate and debunk but could not, match the surface?? it even cost HIM some ridicule and garnered him fame as well, it appears just as this one might now me, if found to be legit. If anyone knows the location of this meteorite or has some pictures I would really appreciate the info! Metal....then what you need to do is stop posting here and take it to a lab for testing. Pay whatever they charge and you will know for sure. It is painfully obvious that the ONLY answer you are going to accept is that you have a meteorite. The folks here are VERY knowledgeable in meteorites, and to them you do not have one. Your continuous insistence that you do have one is NOT going to make them change their mind, and it is NOT going to make your item magically turn into something it isn't. One thing is for certain, if it was a meteorite, you have taken most of the "fusion crust" off of it with the cleaning you've done, people slice meteorites, they cut a window to see the inside, do thin sections, they do an etching of iron meteorites, but they don't clean a meteorite as you have done. It was a great place to start. We all got excited about that first one that wasnt. No big deal. Most guys that find meteorites look for many years to find one and look over lots of rocks before they get one. For what it is worth I know a guy that put a 2 lb. Glorieta Pallasite in CLR overnight to clean it up. It was mighty rusty on one side and the only olivine showing was very stained. Of course the natural finish was destroyed but it did clean things up. He had a fellow polish it up with a little blaster (I don't know what media) and it really looks nice. I like it better that way although the value may have been damaged. It is certainly not the way to clean a meteorite but it is not the end of the world. After all they are just rocks. thanks for the reply, yea I thought about all that too, when cleaning it, I didn't want to destroy it orginal condition, just see what the "metals" looked like just under the surface cleaned up. I only removed small portions of the crust along the side of it where- the shiny materials were poking through, leaving the rest of the "fusion" crust intact. To my novice eye it appears this material was super heated at some time on the outside. The CLR was diluted a bit, and I only soaked it for a few minutes. so only the thinnest of the crust came off, and only by scrubbing with the toothbrush, revealing the "copper" materials below. Also I read in that abstract that lead/zinc/copper meteorites have been found, if this IS a meteorite this combination seems the most likely. to me as its composition. Being as heavy as it is, with so much "copper" colored material in it, it is STILL magnetic, which means there is a great deal of iron/lead/zinc possibly in it and around the "copper" is dark rusted materials that look like iron and are totally different than the metal. If there were no such meteor found, composed of solid type copper, then I would have had to accept it, written this thing off completely and given up, because it appears to be copper to my eye or a combination of metals. and is very dense and heavy and contains some IRON (has to be since its magnetic as copper is NOT magnetic). I did much of the cleaning before looking back and reading all your posts lo... I figured what the heck try it to see, so it is what it is. And chances are its just scrap/human made not space debris, but if NOT, I didn't go too far so Its still pretty much in the condition I found it, only a few spots is the crust removed 90% of the "fusion" crust remains as it was. I was just surprised that the areas of metal I thought were silverish/nickel looking were the result of the iron "crust' over that spot not the color of the material below. I would never have known this had I not cleaned it slightly. So I guess for that find alone it was worth it. time will tell what this is and yes the only way to be sure is to TEST/CUT it . I would also like to have an expert hold this and look at it in person. If it is junk it really LOOKS authentic to my eye, in person I will say that whatever this is it HAS been heated to high temps, it has very unusual pattern of mottling and a crust of some kind that appears to have been created by heat. It has to be part copper/iron and maybe something else like zinc or lead. im sure of that because of the rust I can see from the iron, and the patina I can see from the "copper". . I like the idea of an expert holding it in their hands. That is the only thing that will quench your fire. When you find that expert and get their opinion get back to us and let us know how close our guesses were. Mike is down for "industrial slag" and that is an excellent guess. I would not really call it "slag" as it is not oxidized too badly but for all practical purposes it is a good definition. It is obviously not a meteorite as it has been molten in the presence of oxygen. You can see the metallic froth where that has happened. It also obviously contains copper, which immediately tells you that it is not meteoritic. Also, there is no fusion crust. Nor are there any other indications of surface heating or ablation. You still haven't put a window in it or performed a streak test. Neither have you done a bulk density test as was suggested. A simple hardness test will reveal that your specimen is not meteoric nickel iron. And of course you can send the filings from the window to an assayer and he can give you a metals analysis as well as a nickel percentage. After all these tests are done you will find you have a Cadweld slug or a Thermoweld slug. thanks for sharing Bob, mmmm yea Very possible candidate, I watched the video, But I see no black crust on it when its finished? mine is covered with a black "fusion" crust? all over it? But his looks pretty clean when finished? Also do you know if along with iron is there any LEAD in those? this thing is VERY heavy like lead.. much heavier than copper/iron would be on its own I think. thanks! The video shows the molded metal. If that shot overflows the mold or runs out of the side of the mold it is exposed to oxygen and turns black. Ask a welder how it works...they are familiar with flux and oxidation. Suffice to say that this is an easily identifiable earthy alloy that shows obvious signs of being molten in an oxygen environment. We are telling it how it is buddy. You seem to be fascinated by it all and that is cool. That hunk of metal is teaching you a whole lot. I found a button one time with a metal detector that led to six months research about the buffalo soldiers. By the time you accept the fact that it could not be a meteorite you will be more knowledgable. If you are really stubborn you might be a geologist before you throw that rock away. Sounds like a mangled AP bullet stuck inside a tree for a while. well im a natural salesman, and I don't quit at the first "no" or denial. I have learned that you have to press on sometimes even when it looks bleak. I can accept this is total junk, just trying to figure out if possible WHAT it is. And evidence will support whatever I find. Actually there is a brand new meteorite museum opening today, should be TONS of experts from around the world there at 4pm. ITs invite only so I would have to approach them with it after.. Would be very fun though either way! Im very tempted to bring JOE to the party! lo. there HAS to be someone there that can confirm or deny it in person, it will mean more to me then, and they will have tons of resources where I could test it and other information im sure. You are RIGHT have learned a TON about meteors because of it and to me doing the research and keeping an open mind to all possibilities until sure is the only way to go. Same thing happened with my Roman Coins, what an adventure.. I do remain teachable I really try be humble but I am persistent in seeking facts/truth. Just when you look at it in person up close it just has a feel... if its not legit, man it SURE looks like a space rock up close! that's what I thought at first and it may be just that, the chipper added the "meteorite'' looks its so friggin heavy it HAS to have some lead in it. but how do explain the "fusion" crust all over it" and the IRON in it? Does AP bullets have lead or iron in them? That is exactly what the bulk density test will tell you. You have not found a bullet. It is not an armor piercing round nor is it any other earthy object that has decayed to look like that. I see no decay whatsoever on the object. No indication at all that it has changed much from its original form. AP rounds are steel punches in a copper jacket. There is no steel nor is there a copper jacket. Think about it. Base your hypothesis on things you know. Ask yourself where an alloy of metals such as this occurs. There are very few possibilities and bullets or meteorites aren't one. Soldering, brazing or thermite welding are about your only possibilities that I can think of. I think it is by far the most likely solution where meteorites and bullets would be among the least likely. At least that is how my thought process is working. well im a natural salesman, very curious person, and I don't quit at the first "no" or denial until I exhaust EVERY angle and done a lot of research on it. There are things that fool :"experts" every day. This could be one of them Nature does not like being put in a box. I wouldn't even bother if it didn't look so legit to my eyes close up under magnification. The odd thing is if the chipper made the marks in the copper, how come they are STILL covered in the black crust? they shouldn't have any crust left on them and be smooth, maybe some corrosion, but this is covered EVENLY with black crust including the mottling. Once I get that, it will mean more to me then assessment by pictures only. also im sure they will have tons of resources where I could test it and other information about meteors maybe even the location of the EATON could be had!. You are RIGHT have learned a TON about meteors digging up that old article was incredible to find out about copper. all because of it, and to me doing the research and keeping an open mind to all possibilities until sure about it, is the only way to go. Same thing happened with my Roman Coins, what an adventure.. I do remain teachable I really try be humble but I am yes I am stubborn sometimes I don't quit easily, and Im persistent in seeking facts/truth. when you look at it in person up close it just has a feel. of something strange.. if its not legit, man it SURE looks like a space rock up close! Hmm now learing about AP bullets lo... that's sound logic to me.. and thanks bob I would tend to agree then, no bullet. also I think its too wide for that. it also doesn't account for the crusting all over it. Your slug is the best candidate so far, odd thing to me is the malformations are also under the crusting? If that crust was there and it hit the chipper, the mottling spots should be clean, because any crust would have been removed by the chipper blades? But the mottling is UNDER the crust? How do I go about getting a bulk density test done on it? Start here. It will tell you how much heavier than iron your object is. If you are serious about identifying it get it assayed. Compare that assay to the published data on various types of weld metal. Then compare it to the published results on meteorites. You will be able to make some very broad assumptions with that info. You can get it analized a lot of places. The best way is to file that window that we are talking about and send the cuttings off. Don't try to prove it is or is not a meteorite. Try to find out what it IS. That is going to be fairly easy. An expert will smile and hand it back to you and tell you exactly what we are telling you. There is no way to find out where that metal came from without knowing the alloy and composition. The only definitive answer you will get without metallurgy is ,"it is not a meteorite! ".